Back in the 19th and early 20th centuries, religious dictates made it hard for medical schools to find bodies to use for dissection so models had to be made to teach students about anatomy. Many of these were painstakingly made with paper mache. If you haven't seen these models, I highly recommend taking a look (if you're not too squeamish!). They are truly beautiful. You can find a good selection here. The Victorians started out by copying lacquered paper mache boxes and screens from Japan and China, and then they started making furniture. Henry Clay invented a process in the late 1700s that made a heat-resistant paper product as hard as wood. 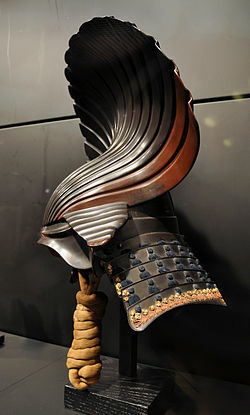 Paper and lacquer were used to add decorative elements to samurai helmets and armour in Japan. Masks are probably one of the most common uses for the medium. This one is from the Japanese Noh theatre and was made in the early 20th century. I found plenty of adorable animal masks for sale on Etsy as well. Making puppets has always been on my list of things to do. Perhaps I'll add one to my paper mache repertoire! A friend of mine was really into radio when we were in university so I made her this sculpture using real radio parts, paper mache, and collage. She was the first recipient of one of my hearts and I also made her a paper mache fish as a house-warming gift... She's probably hoping I don't make her any more bizarre objects. I made this ornament for my mom for Christmas one year when I was a student and trying to save money by making all my gifts. Her Rottweiler, Tara, had passed away that year so I wanted to give her something to remember her by. This was another project from an ambitious Christmas. I made two of these, one for my mom and one for my aunt, with different patterns. They were inspired by my trip to (surprise!) New Mexico and the amazing art that I saw there. I think I should probably make more of these. A cross-section of a heart would look amazing in one of these box frames. My most ambitious paper mache project was the set design for the play The Love of the Nightingale in university. I made two six by six foot triangles and had them mounted on castors so the actors could roll them around the stage to create the various settings of the play. It was an enormous amount of work and even with the help of friends, actors, and anyone else I could drag into it, I spent many a late night in that shop. Look how much fun I'm having, covering that giant frame bit by bit, by bit. How do you feel about paper mache? Fun? Gross? The best way to make things every? Leave a comment!